Southland Snapshot: Back to School Preparations and New SLP! 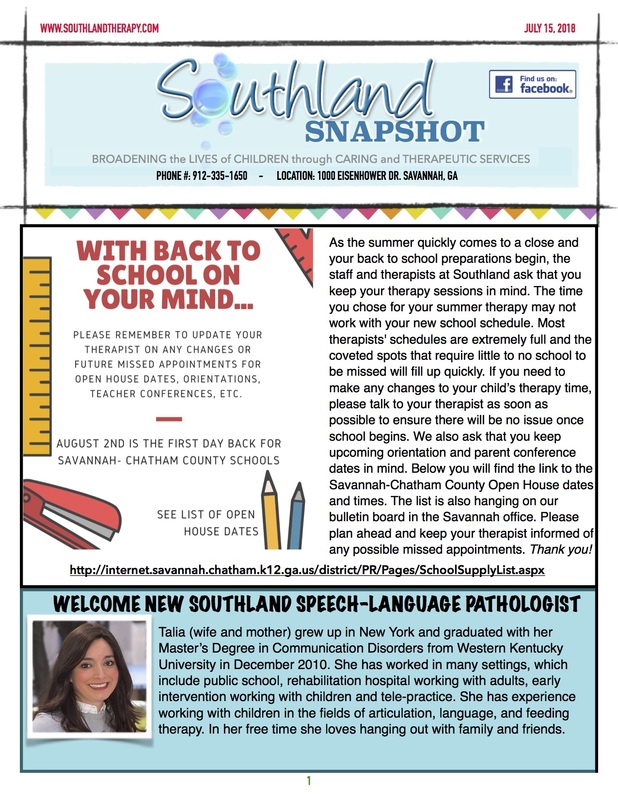 - Southland Therapy Services, Inc.
Southland Snapshot: Back to School Preparations and New SLP! Click here for PDF version! With back to school on your mind..
As the summer quickly comes to a close and your back to school preparations begin, the staff and therapists at Southland ask that you keep your therapy sessions in mind. The time you chose for your summer therapy may not work with your new school schedule. Most therapists’ schedules are extremely full and the coveted spots that require little to no school to be missed will fill up quickly. If you need to make any changes to your child’s therapy time, please talk to your therapist as soon as possible to ensure there will be no issue once school begins. We also ask that you keep upcoming orientation and parent conference dates in mind. Below you will find the link to the Savannah-Chatham County Open House dates and times. The list is also hanging on our bulletin board in the Savannah office. Please plan ahead and keep your therapist informed of any possible missed appointments. Thank you! WELCOME NEW SOUTHLAND SPEECH-LANGUAGE PATHOLOGIST! Talia (wife and mother) grew up in New York and graduated with her Master’s Degree in Communication Disorders from Western Kentucky University in December 2010. She has worked in many settings, which include public school, rehabilitation hospital working with adults, early intervention working with children and tele-practice. She has experience working with children in the fields of articulation, language, and feeding therapy. In her free time she loves hanging out with family and friends. Preparing to go back to school can be an exciting time. The new school year may also make a child who doesn’t adjust well to change feel nervous and overwhelmed. Read on for more tips on how to prepare your student for a new a schedule and school year. Meeting the teachers and seeing the layout of the school and classrooms may help ease some anxiety about what to expect. Be sure to ask lots of questions so you and your child leave feeling more empowered and secure. If they allow the student to attend, bring them along! Seeing their new surroundings before the “big day” may help lessen some fears. Taking photos of their teacher, classroom, lunchroom, cubby or locker, etc… during the orientation could be a useful tool to prepare your child for their new routine. When talking about their new schedule, and the wonderful new people they will work with, it’s very helpful to have a visual reminder to make this new adventure less scary. Look at the photos each day as school approaches and help them talk about all the new things they are excited for. If edits need to be made to your child’s IEP, now is the time to set a plan in motion. Some schools evaluate the students during the summer, so definitely bring this up during the open house. If a new evaluation is needed, make plans now so they don’t influence the start of the school year. As always, if paperwork from Southland is needed to supplement any documents or advocate for accommodations, please ask us for a copy! Summer allows for sleeping in and having a more relaxed schedule. Once school starts, catching the bus and being busy all day may take it’s toll on your little ones. Starting this new routine a few weeks before the first day of school may make your mornings a little less chaotic. Remember that school can be fun! We know that any change in routine can add stress; we hope that you and your family keep in mind that learning can be fun also. Remember the value of reading and the important place is holds with acquiring and practicing language skills. Talk with your children about what they are learning and the new people and skills they experience each day. We hear that school is “boring” and they learned “nothing” but we know there must have been something that stood out to them- even if it was being kind to the kid sitting alone at lunch. South Carolina Occupational Therapist Melinda welcomed new baby Indrielle “Indy” Jolyn Morris. She was born on 6/18/18 at 6:07am at a whopping 9 lbs. South Carolina Occupational Therapists Bridget welcomed new baby Lyla Rabia Fijlane. She was born 6/22/18 at 6:22 am weighing 11.1lbs 21 inches long. KUDOS TO SLP PAT FOR A GREAT SUMMER! 16 SPEECH EVALUATIONS and covered for multiple therapists while they were on vacation. Way to go Pat! You took the record for evaluations this summer! 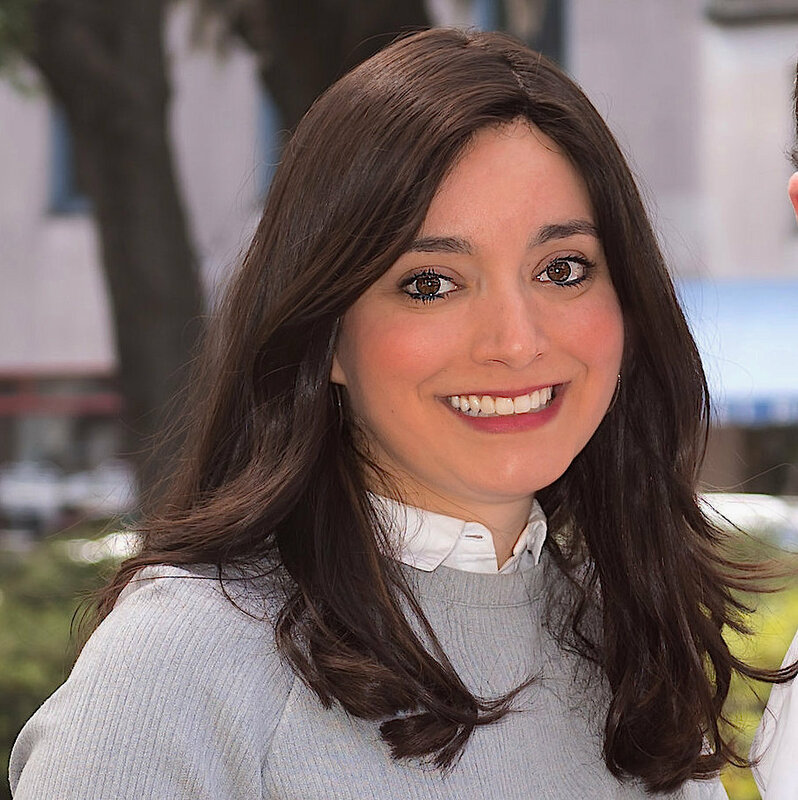 Pat works as an SLP in the Savannah – Chatham County public school system during the school year as well as with us here at Southland Pediatric Therapy. We were lucky to see more of her this summer when she had free time to see more amazing Southland kiddos! Good-luck with back to school preparations Pat! Southland Snapshot: Back to School Edition! Hiring Pediatric Occupational Therapist- Charleston, SC!